Bio-degradable ice bucket poly bag, 9.5" x 10" with 4" gusset on both sides. Fits most 2-3-quart ice buckets. Cost is per case/1,000 bags. Minimum: 1 case A stylish, yet economical way to let your guests know that your room glasses are clean and sanitized -no need for "motel-type" paper bags. 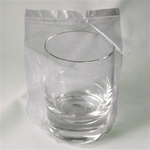 4" x 2" x 12" h high-clarity plastic bag, FDA-approved. Will fit any type of standard tumblers, and is long enough for wine glasses. Cost is per case/1000 bags. Minimum: 1 case. Please call for free samples. Also available in a shorter version - when you don't need to cover wine glasses: No. 815-7G042008 (4" x 2" x 8"h). SuperScrape™100% black rubber entrance mat, 4' x 8', is designed for high-traffic outdoor areas. Pressure-clean it with confidence, the 3-color Courtyard logo is permanent and will not fade. Slip-resistant for ultimate safety - these mats have excellent durability and traction properties, rubber safety borders. Effectively removes tough dirt, grime and water from shoes. Resistant to oils and chemicals and will not fade. Also available with all other Marriott logos, as well as in plain black. Custom colors and sizes no problem - please contact us. Minimum order: 1 mat. Fairfield Inn/Fairfield Inn & Suites 16-ounce glass candy jar with lid - add the ouch of home to your rooms and front desk with this classic candy jar. Easy to fill with bulk candy. 4" w x 5 1/2" h.
Please add a one-time $55.00 screen charge (per color). This product can be customized with your property-specific information (please contact us): Minimum 250 pcs. - $0.99 each. Please add a one-time $50.00 screen charge (1-color imprint). Glaro RecyclePro "Profile" half round 10-gallon recycling receptacles come in a beautiful 30" x 18"x 9" designer color finish. Choose from 29 elegant designer color finishes as well as 5 different recycling covers (please choose below). Finely crafted in the U.S.A. by Glaro, these durable, all metal, fire-safe units feature a full width piano hinged cover and rustproof aluminum bottoms and are great indoor/outdoor, low profile, space saving recycling receptacles. SuperScrape™ 100% black rubber entrance mat, 3' x 5', is designed for high-traffic outdoor areas. Pressure-clean it with confidence, the Fairfield Inn or Fairfield Inn & Suites logo is permanent and will not fade. Slip-resistant for ultimate safety - these mats have excellent durability and traction properties, rubber safety borders. Effectively removes tough dirt, grime, and water from shoes. Resistant to oils and chemicals and will not fade. Also available with all other Marriott logos, as well as in plain black. Custom colors and sizes no problem - please contact us. Minimum order: 1 mat. HAPCO 8-quart commercial wastebaskets are low profile and sleek. Meets the most stringent fire approval standards. Will contain fire without burning and most important will not melt or collapse. Don’t be confused with others called fire resistant that will melt, deform, and allow the fire to escape. U.L. Approved. 7-31/2"l x 9-1/2" w x 10" h. Avialable in Beige, Sand, Gray, Brown, Black, and Blue. 6 pcs. per case. Minimum: 1 case. Our best seller - the one and only Spa Duck! White rubber duck with mud facial mask and towel. 3" x 3-1/2" x 3-1/2" high. Balanced weight for floating. Minimum 50 pcs. plain. This item can be imprinted with your logo (50 pcs. minimum, please add $0.05 per piece and a one-time screen charge of $38.75 - allow 1-2 weeks for production). Shown here as imprint option. Courtyard by Marriott SuperScrape™ rubber outdoor mat 2-1/2' x 3', No. 778-02/253L/05 Stainless steel ice bucket with double steel wall insulation, #780-IBDW3NH case of 6 pcs. SuperScrape™100% black rubber entrance mat, 2-1/2' x 3', is designed for high-traffic outdoor areas. Pressure-clean it with confidence, the 3-color Courtyard logo is permanent and will not fade. Slip-resistant for ultimate safety - these mats have excellent durability and traction properties, rubber safety borders. Effectively removes tough dirt, grime and water from shoes. Resistant to oils and chemicals and will not fade. Also available with all other Marriott logos, as well as in plain black. Custom colors and sizes no problem - please contact us. Minimum order: 1 mat. Stainless steel ice bucket features stainless double wall insulation to keep ice longer and prevents messy outside condensation. 3-quart capacity, 7-1/2" top diameter. 6 pcs. per case. FashnPoint ® white guest towels are soft and absorbent (a medium between paper and linen-like material). The unique EZFold allows users to easily pick up one towel at a time. 11.5” x 15.5”, 1/6-fold in dispensing box. Price is per case of 600 pcs. Customized 100% Nylon floor mat, 2' x 3', is designed for high traffic indoor areas. Your logo is permanently dyed directly into a three-dimensional nylon carpet and will not wear off over time. Treated with Perma-Dye™ plus Stain Stopper for long-term colorfastness. Mat is launderable and can be steam-cleaned. Industrial rubber backing is guaranteed to lay flat and will not crack or curl. Rubber safety border. No art charges - no set-up charges. Choose from 25 carpet colors (select below) and select your imprint color (select below). Minimum order: 1 mat.